So, where is this app? 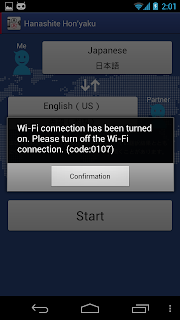 I'm using an SC-05D (Galaxy Note), with a docomo SIM (the 7GB monthly plan), and I've got WiFi turned off. Searching for "HanAshite" (you misspelled the name in the title, btw) shows nothing. Ditto for "honnyaku", "honyaku"... Oh, "hon'yaku" does find "Utsushite Hon'yaku" by NTT DOCOMO. 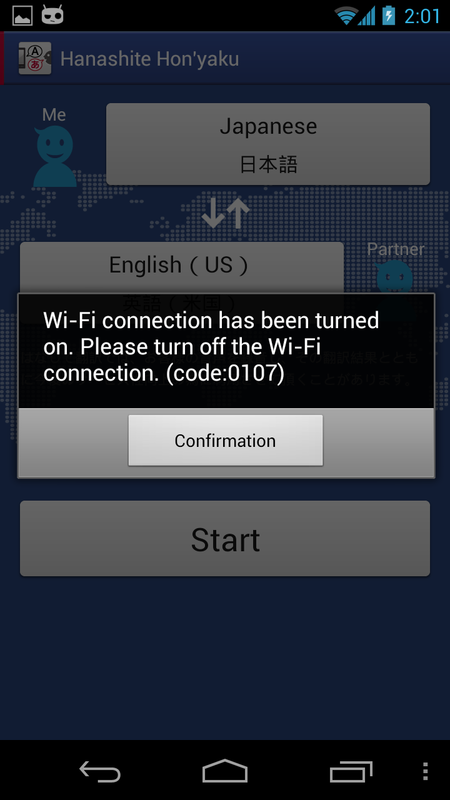 I wonder... if you're on Docomo, dl the app, then try to use it with an overseas WiFi connection, will it work then? Followup: NariTra is a similar app that works on non-docomo devices and off docomo's network. It functions similarly, has the same language pairs as Hanashite Honyaku, and it has a similar proficiency level. 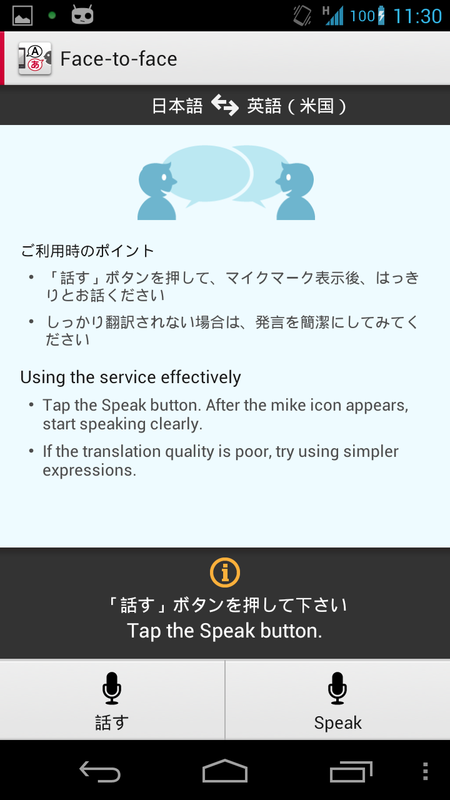 It recognizes English well and Japanese not so well. I'm thinking NariTra and Hanashite Honyaku share both the same translation database and the same speech recognition engine. Google Translate functions a bit differently. 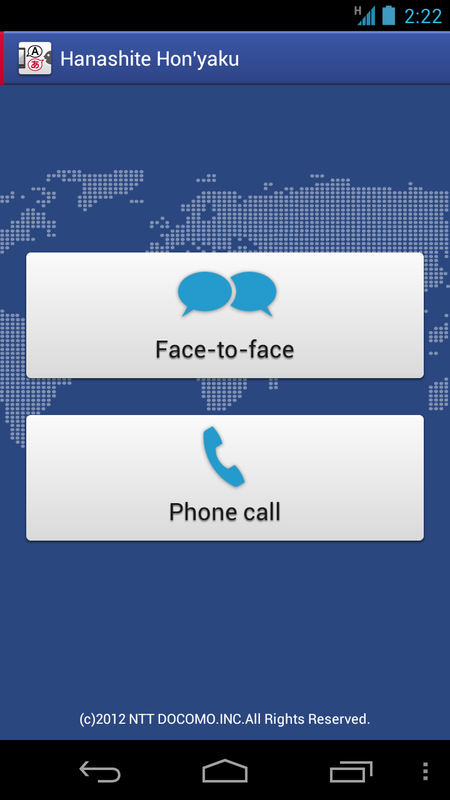 There are more screen taps necessary for voice playback, but it seems to work better. It does a much better job of recognizing spoken Japanese. I used both google translate and NariTra on my Nexus 7. I don't see much advantage to using docomo's app when compared to these other two. It won't work on wifi. The heavy lifting is done in the cloud and if the connection is not mobile with a DCM SIM card, the app will refuse to work. Yeah, you could probably fool the app into thinking it had a mobile connection, but for the average person, that isn't an option. should have included a link. I wasn't sure how to romanize it. Nice try docomo! We actually replied to the "testers wanted" ad in the 朝日新聞 and were involved in testing the app about 6 months ago. It didn't work very well then...seems it got a little better...barely... BTW, I've got a docomo sim card stuck in a non-docomo phone using only wifi for connectivity and it won't let me try the "fruits of our labor"...ah shucks. so yeah, it seems that you have to have a docomo sim + a docomo data plan to make this work. Trying to get it to work with bmobile, downloads ok, but whenever I try and use it I get an error. Guessing that's their way of saying I'm not on bmobile? I'm on b-mobile and I managed to download it and get it working. Are you running a rooted phone and/or one with a non-docomo skin? Rooting will remove access to many of the pre-installed docomo apps (such as osaifu-keitai) unless you do it in a certain way. 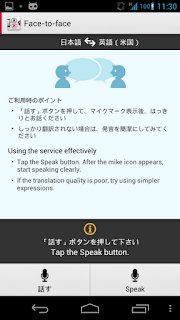 Mind you this app isn't particularly good and it probably isn't worth keeping anyway, especially considering the translations it records user information. I figured I would download this for my girlfriend (who doesn't speak any English) to use when travelling overseas but in the end I think one of the regular dictionary apps (like JED) combined with google translate works a lot better overall. 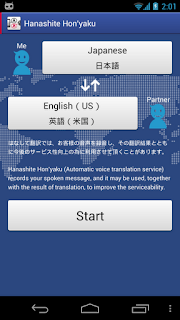 Do you know, there are many other translation apps. Parlomondo supports many languages via wifi. Translate.google.com is well known. Jibbigo doesn't require any connection - it runs completely on the device - you don't need any contract, wifi. I used it pretty well in Shanghai. Not sure which of the above is best for J input, though. Anyone?